Farmers wanted to have their own warehouse at their respective constituency! Organic rice has increased its interests from local consumers and exporters in recent years. It is the fact that a country that has about 3,800,000Ha of farm land for agricultural production, especially rice. If there is sufficient qualitative irrigation system, then it could produce about 9,500,000,000.00Kg or 9,500,000.00ton of rice production in average annually. Unfortunately, the expected rice yield production could not reach that amount as smallholder farmers still depend much on rain fall for agricultural production, lack of access to grant from development partners to invest on agriculture and agri-business directly with farmers’ organizations that could restrict growth of agriculture in Cambodia. Farmers’ organizations could not access to loan with low interest rate to extend agri-business with farmer members. The Royal Government of Cambodia targeted to have 1million ton of rice to export by 2015, but Cambodia failed to reach the plan and only about 0.5million ton exported in 2016. 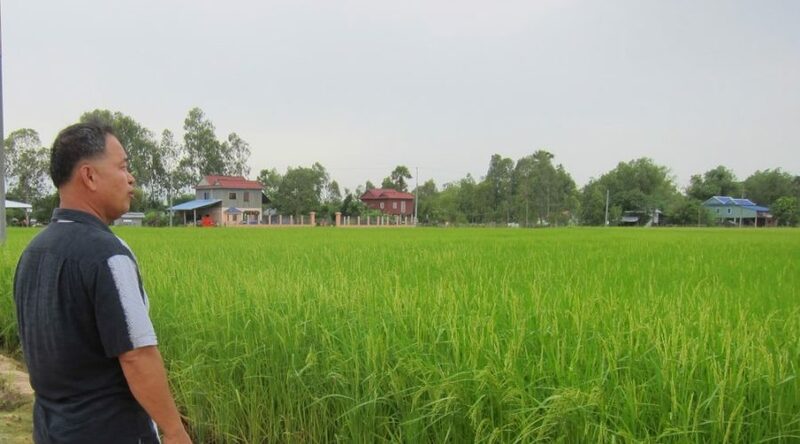 Recently, CFAP’s head of management, Sok Sotha visited multiple agricultural producer farmer in CHEK Agricultural Cooperative, Mr. Pao Sophon to learn of how organic rice has grown after using organic fertilizer of about 250Kg per Ha on his rice farm. As a result, we could estimate that he would have about 3ton per ha of red Phka Rumduol (Phka Rumduol Krahorm), though we will wait until he harvested in coming weeks. Sophon has changed from normal rice to fragrant rice (Phka Rumduol Krahorm) on his 3ha of rice field in 2017 after piloting in 2016 with higher yield. As one of CFAP’s local capacity builders, he is willing to share knowledge and experience on organic fragrant rice production and animal rearing to other farmers. According to various meetings with farmers, we were told similarly that fragrant rice has been facing with more challenges compared to normal rice as pests like it mostly, so it is required to take them care from growing to harvest. Another concern, farmers are worried about the prices of organic fragrant rice are inflation that could make them loosed. CFAP under the Medium Term Cooperation Programme phase 2 funded by IFAD, EU and SDC has explored more funding opportunity and involvement of farmers’ organizations in agricultural development programmes to focus on strengthening of smallholder farmers to enterprise their produces properly to market now and in the future. Farmers wanted to have their own warehouse at their respective constituency to collect produces from farmer members to supply market in the future. Copyright © CFAP Cambodia 2017.